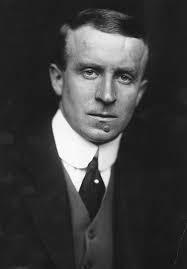 John Buchan was born the son of a Free Church minister in August 1875. He grew up in Fife and the Borders, and was educated at Glasgow and Oxford Universities. He had a career as a lawyer and politician, but also edited The Spectator magazine for a number of years from 1909. His sister Anna, who wrote under the name of O. Douglas, is also worth exploring. Her published work dates from the war years and tend to deal with domestic matters. They are tight on copyright so the easiest thing is just to point you in that direction – you can find out most all you want to know about him from their site. If you want a personal visit there’s always http://johnbuchanstory.co.uk/ the museum in Peebles. To find out more about John Buchan’s writing we recommend the ebook edition by Delphi Classics. Buy the parts edition as it’s easier to navigate the huge collection. For paperbacks your best online bet is probably Amazon, though his work's pretty easily accessible in libraries, second hand and probably even in 'live' bookshops. O.Douglas can also be got from online and real libraries with reasonable ease. A Man of Style and Substance who changed with the times. I personally find his fishing, country stories most interesting. Which is simply to say I prefer Buchan in nature rather than Buchan among men. The tension is one which may be seen in The Thirty Nine Steps (and other works). A generation on from Crockett and Barrie, themselves a generation on from Stevenson, and during a time of great change in publishing fashions, Buchan continued to develop his style and with it the genre of adventure novel. His ‘new’ style found real success in the war years and beyond. His work is unashamedly imperialist and his politics equally so. But leaving politics aside, his contributions to adventure writing are significant. His style really found favour in the 20s and 30s and, one might think, laid ground for the likes of Ian Fleming and Graham Greene. Buchan stood on the cusp of significant stylistic changes in fiction writing and he while he was sometimes floundered in the old style, he flourished in the new. He’s an interesting writer to juxtapose with those of the earlier adventure romance writers from Scott onwards as he reveals a path through publishing which is often poorly critiqued. Unlike many of his immediate predecessors, Buchan did not have to live by fiction, so perhaps was freer to adapt to the stylistic circumstances, and it’s definitely worth reading some of his essays and historical works as well to get a complete picture of the man. In 1909 Buchan began work for the publisher Thomas Nelson and Sons during which he spent a great deal of time writing for and editing the The Spectator newspaper. Of course, most people know him not even through his books but through film adaptations. Buchan was hugely successful both in his political and writing career, becoming Lord Tweedsmuir and Governor General of Canada.